No element of MaRS has garnered more scrutiny than the West Tower — Phase 2 of the innovation hub’s development. Here’s the real story behind the headlines. It was 2007 and MaRS needed more room. 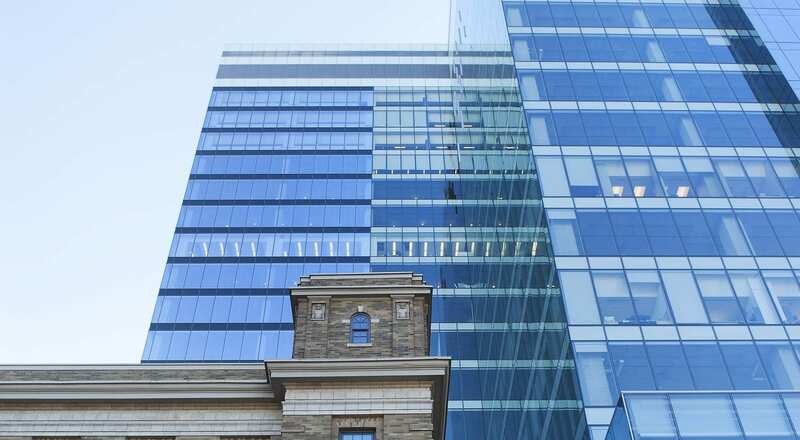 With the original towers of Phase 1 fully leased, demand was high from companies and research groups, like the Ontario Institute for Cancer Research (OICR), which was outgrowing its existing space at MaRS, and Public Health Ontario, which, in the wake of the SARS outbreak, needed to move its facilities closer to the hospitals. To meet demand, MaRS embarked on a plan to launch Phase 2 — building the West Tower, which would add 780,000 square feet. “In 2007, when we were considering the Phase 2 expansion, we ran an international RFP [request for proposal], and Alexandria Real Estate Equities [ARE] out of the U.S. won the contract to do the development,” says Ilse Treurnicht, CEO of MaRS. With that original agreement, the funding to build Phase 2 would have been entirely private. ARE, a Pasadena, Calif.-based property developer active in constructing some of North America’s leading innovation and technology hubs, agreed to lease the land from MaRS, paying for the development of the property and getting the benefit of revenue from companies that would lease the space. ARE started construction, excavating and building to ground level. Then in November 2008, the global financial crisis hit and ARE halted construction — indefinitely. MaRS exerted pressure on ARE to restart the project, but the developer had decided to let the project “sit.” “We were now also sitting with a project that was stopped for three years [through] Canadian winters,” notes Ms. Treurnicht. The innovation hub engaged in discussions with the Province of Ontario, and by August 2011 it was agreed that MaRS would step into ARE’s shoes as developer. ARE would retain a passive interest in the project. Infrastructure Ontario provided a fully secured, repayable loan of up to $235-million to complete the core and shell of the building. “It wasn’t our first choice, but as a non-profit, with no balance sheet, we had limited options,” says Ms. Treurnicht of the deal. The loan enabled MaRS to complete the building by 2014, but roadblocks remained. Because ARE retained an interest in the West Tower as consideration for its invested funds, it had residual rights — and over time a misalignment of interests stalled the leasing process. “It became really clear to us that in order to execute on our mission and make sure this infrastructure was put to use for the innovation community, [we had] to regain control over the project,” says Ms. Treurnicht. In September 2014, the provincial government appointed an expert panel to evaluate the project and they concluded that additional lending should be provided to complete a buyout of ARE’s interest. Ontario’s Ministry of Research and Innovation stepped in as sole lender to the project, providing a combined lending facility of up to $379-million. “MaRS has been an integral partner, as Ontario carves out a reputation as one of the world’s most dynamic and welcoming places for research and innovation,” says Reza Moridi, Minister of Research, Innovation and Science. A substantial portion of the loan will be repaid within five years and the balance in 20 years. “That’s the path we are on at the moment, well ahead of schedule,” says Ms. Treurnicht, who points out that the University of Toronto also became an equity partner in the building in August 2015. Today, over 93 per cent of the building has been leased, with the remaining 7 per cent in final negotiations. “We had a really big problem to solve. Our private developer stopped the project in the middle of an unprecedented global recession. But we fixed it and we are now positioned in a much better place for the future, because we control our destiny fully,” says Ms. Treurnicht.